There is nothing really at stake in this game although the away team knows that they could take a massive jump up the table if results go in their favour at the end of this week. It has been a difficult season for Galatasaray and their 10-18 record is indicative of the struggles that they have endured this season. The Spanish side are currently sitting with a 16-12 record and they’ll fancy their chances of improving that record by the end of this week although it is always a difficult task in Turkey. 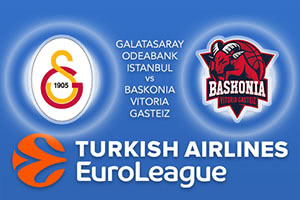 The Spanish side have the upper hand over Galatasaray with three wins out of three and when the teams met earlier on in the campaign, it was Baskonia who grabbed the win. That clash finished 69-62 and the Spanish side were boosted by strong showings from Vladimir Micov, who has provided an average of 11.3 points per game while Sinan Guler has offered an average of 10.2 points per game this season for the Turkish team. Alex Tyus has also offered an average of 10 points per game and there are enough players in the Galatasaray side to have an impact. There have been a number of players who have performed well for Baskonia with Shane Larkin offering an average of 12.9 points per game, Rodriguez Beaubois who has provided an average of 11.6 points per game, Toko Shengelia has offered an average of 11.2 points per game while Johannes Voigtmann has notched an average of 10.1 per game. This should mean that the Spaniards have more than enough games to make a difference and if the Baskonia side has the right attitude for this clash; they should have enough to see it out in good style. Both teams will be desperate to win this game but the Spaniards will fancy their chances of having an impact on Friday night in the Euroleague. You can back Baskonia Vitoria Gasteiz at -5, at odds of 1.90. If you’re looking for the Over/Under market, go UNDER 159.0 at odds of 1.90. Bet Now!